The seventh of nine children of Joseph and Katherine Jackson, Michael Joseph Jackson was born in Gary, Ind., on Aug. 29, 1958, and began his career performing with his brothers. His professional debut with the Jackson 5 came in 1969. The group set chart records with its first four singles, including "I Want You Back" and "ABC." As a solo artist, Jackson also recorded four albums for Motown Records before moving, with his brothers, to Epic Records, where they continued to record as the Jacksons until 1984. Forming a partnership with producer Quincy Jones after working together on the 1978 movie musical The Wiz – in which Jackson played a rather sheepish Scarecrow to Diana Ross's Dorothy in the urban adaptation of The Wizard of Oz – Jackson released his solo album Off the Wall, co-produced with Jones. The disc spawned monster hits including "Don't Stop 'Til You Get Enough" and "Rock With You." His second Epic solo album, 1982's Thriller, is often cited as the best-selling album of all time. The video for Thriller all but defined the music video genre, while the album sold 40 million copies in its initial chart run, with seven of its nine tracks reaching the Top Ten. It was also nominated for 12 Grammys and won eight. On March 25, 1983, Jackson performed his single "Billie Jean" live on the Motown 25: Yesterday, Today, Forever TV special, where he debuted a dance, the moonwalk, that was to become his signature move. The following year, the singer was filming a Pepsi-Cola commercial at the Shrine Auditorium in Los Angeles when he suffered second-degree burns after pyrotechnics set his hair on fire. 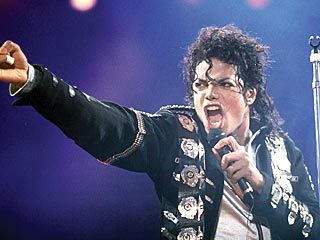 The singer settled out of court and established the Michael Jackson Burn Center with his $1.5 million award. In 1984, Jackson did his final tour with the Jacksons to support the album Victory. The one major hit from the recording was Michael's duet with Mick Jagger, "State of Shock." The next year, Jackson began to put charity first and co-wrote and sang (along with Willie Nelson, Tina Turner and nearly every pop star known at the time) "We Are the World," on behalf of USA for Africa. Then came the 1987 album Bad, when some slippage in his popularity began to show. At the time, the reclusive Jackson, who was raised a Jehovah's Witness, started construction on a mini-Disneyland as his residence, which he named Neverland, a place to live out the childhood he claimed he never had. In 1993, Jackson addressed persistent rumors, telling Oprah Winfrey on her TV show that, contrary to reports that he was bleaching his skin a lighter shade, he in fact suffered from a condition called vitiligo. He also said that his father physically abused him as a child. Not long after, Michael himself was accused of abusing a 13-year-old boy who slept over at Neverland, though police found no evidence to support the claim when they searched the ranch. The case was settled by Jackson for an undisclosed sum. When other allegations of a similar nature emerged, Jackson maintained his innocence. In May 1994, Jackson and the daughter of the late rock icon Elvis Presley, Lisa Marie Presley, were married – and very soon split up. After their 1996 divorce, Jackson married Debbie Rowe, a nurse in the office of one of his doctors. Two children were born to the couple: son Prince Michael Jackson I, in 1997, and daughter Paris Michael Jackson, in 1998. Jackson later had a third child, Prince Michael Jackson II (nicknamed "Blanket"). Professionally, Jackson was losing some of his luster, and the reception to his 1995 album HIStory: Past, Present, and Future, Book I was mixed, even though it produced two hit singles: "You Are Not Alone" and "Scream," the latter a duet with his sister Janet Jackson. By the time Jackson's 2001 album Invincible arrived, the artist was known for being as much an eccentric character as he was a serious musician. In 2002, Jackson further damaged his reputation when he held son Blanket over a hotel balcony in Berlin so his fans on the street could see the child. Once again, when the critics threw bricks at him, Jackson said he was acting out of innocence. The real trouble came in 2003, with a TV documentary, Living with Michael Jackson, in which the star told British journalist Martin Bashir that he shared his bed with young children. In 2004 came Jackson's arrest on a slew of ugly charges, including lewd conduct with a minor, attempted lewd conduct, administering alcohol to facilitate molestation and conspiracy to commit child abduction, false imprisonment and extortion. A media circus ensued at the trial – one day a very late Jackson showed up to court in his pajamas – though on June 13, 2005, Jackson was acquitted of all charges. Saying that he felt that Neverland had been contaminated by police authorities who had gathered evidence against him, Jackson moved himself and his children to Bahrain. Amid promises of a new album, Jackson languished as an artist. Earlier this year, he announced that he would perform a series of concerts in the U.K. He said that these would be his final curtain call – his farewell to his fans.